I had work done on a tenon, rotator cuff and arthritis in my left shoulder on Feb 3. Home by noon that day, in a Skype meeting Thurs 11am, Palouse Prairie School events Th and Sat, off the 12-hour pain pills Fri noon, finished the anti-inflammatory drug Sun, and back in the office Monday 8th. 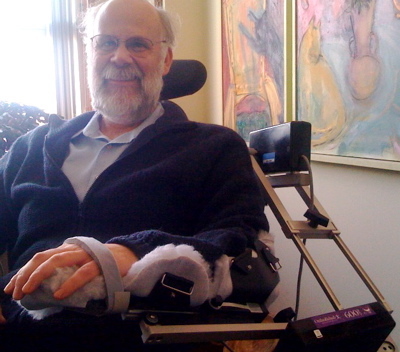 The doc’s goal is to elevate my arm 140 degrees and to rotate it (extension) 40 degrees with the chair. Below is my training data, charted thanks to Google Docs. Because of the tenon work, I wear a sling 24×7 and can do no weight bearing activity for this 1st month. This first week I found I need a warmup session (1 hr) each day and then an achievement session. Week of Feb 15: Day 11 was Sunday, I did not ride the chair and suffered a setback. On Monday (day 12) I did 3 sessions; warmup and achievement, and then I tried a 3rd session, doing 5 repetitions and advancing a few degrees and reached 140 briefly. Tues I used the 5 rep process to get from 80 to 140, then did an hour at that level. Week of Feb 22: I took the next weekend off (day 17 & 18) and required a warm-up session on Monday (day 19). Wed (day 21) I’m only getting a total of 90 minutes in 2 sessions. My pectorals are sore. The shoulder joint is nort bothering me. On Thurs this week my daughter noticed fluid behind the elbow. Its a lump about the size of a walnut that feels like jello. It is a little tender, but not painful. I tried an ace bandage on it for two nights. No effect and the bandage is annoying. On Saturday, while getting into the shower I took off my glasses with my left hand — which was a surprise because I didn’t know it could reach that high. Week of March 1: I took a three day weekend (days 24,25,26). On Tues, day 27, I got to 140 in about 10 minutes with only some discomfort. I only got 60 minutes of training. Wed, day 28, I easily got to 140 and will get two sessions. A friend recommended I try arnica gel as a rub. I started this Sunday before bed and am doing 2x per day. It might be reducing some of the ache, but its not dramatic. The company and the Doc’s office are working out that I can keep the chair another 3 weeks — oh, joy. I am cheating and taking off the sling to use my laptop in my lap for 1-2 hour sessions. What a difference to type two-handed. Week of March 8: I got back to the140-40 regime in about 10 repetitions, starting from 100-40 on Monday. Doc says to wear the sling for 10 more days (6 weeks total). Presently my left fingertips can reach to me right armpit, but not enough for bathing. Changing that will be my personal goal in PT. Week of March 15: A surprise vacation meant I missed my Monday session, however Tues was not difficult. I see the Doc Thurs this week. I’m anxious to get out of the sling and into some kind of PT. I toyed with increasing the range of motion on the CPM, but decided to wait and ask Thurs. You are currently browsing the archives for the Random cool stuff category.